Af­ter vis­it­ing 68 or­phan­ages in 13 coun­tries, we no­ticed the same thing hap­pen­ing over and over again. Or­phan­ages would care for chil­dren for years and then send them to the out­side world where as many as 90% of them would fail to thrive. Many re­sort to crime, pros­ti­tu­tion and gangs sim­ply to sur­vive. So we de­cid­ed to try to do some­thing about it and in 2016 we start­ed our tran­si­tion pro­gram Youth for Hon­duras in Tegu­ci­gal­pa. Our goal is to build a sys­tem to works and then teach oth­ers. The ear­ly re­sults have been promis­ing with a suc­cess rate of 80%. Thank you for help­ing make it pos­si­ble! World Or­phan Fund vol­un­teer Va­lerie John­son vis­it­ed our team in June and shares her ex­pe­ri­ence here. At the be­gin­ning of June, I took a trip to Hon­duras. Since I’ve been back, the news in the Unit­ed States has been full of the trou­bles at the bor­der with those seek­ing to en­ter the U.S.—it makes me dou­bly sure that our ef­forts in Cen­tral Amer­i­ca are more im­por­tant than ever. The fo­cus of my trip was to learn first-hand about the Tran­si­tion Hon­duras pro­gram sup­port­ed by the World Or­phan Fund. I’ve been work­ing re­mote­ly as the out­reach co­or­di­na­tor for those wish­ing to spon­sor the youth in the pro­gram and it was time for me to put boots (san­dals) on the ground! Meet­ing the Tran­si­tion Hon­duras staff in per­son was a hum­bling ex­pe­ri­ence. As they (Cathrine, Jose Ra­mon, Michelle, Kar­la, Jose­lyn, and Han­na) dis­cussed their job du­ties, it was ob­vi­ous that they are the most ded­i­cat­ed, thought­ful, hard-work­ing group of peo­ple I’ve ever met. This isn’t just a job to them. They care deeply about their mis­sion to make a pos­i­tive fu­ture pos­si­ble for the young adults ag­ing out of the or­phan­ages. pro­vide tu­tor­ing as­sis­tance for the dif­fi­cult class­es and much, much more. These young adults are leav­ing the shel­tered en­vi­ron­ment of an or­phan­age where they may have spent a ma­jor­i­ty of their lives and where of­ten all choic­es had been made for them. They haven’t had the chance to grad­u­al­ly ac­cept re­spon­si­bil­i­ty for their own de­ci­sion mak­ing as they pro­gressed to­ward adulthood—the way our own kids are of­ten able to test the wa­ters of be­com­ing an adult with­in the safe­ty of a fam­i­ly home. This means life out­side the or­phan­age is ex­po­nen­tial­ly more in­tim­i­dat­ing and dan­ger­ous than when our own teens head off to col­lege. 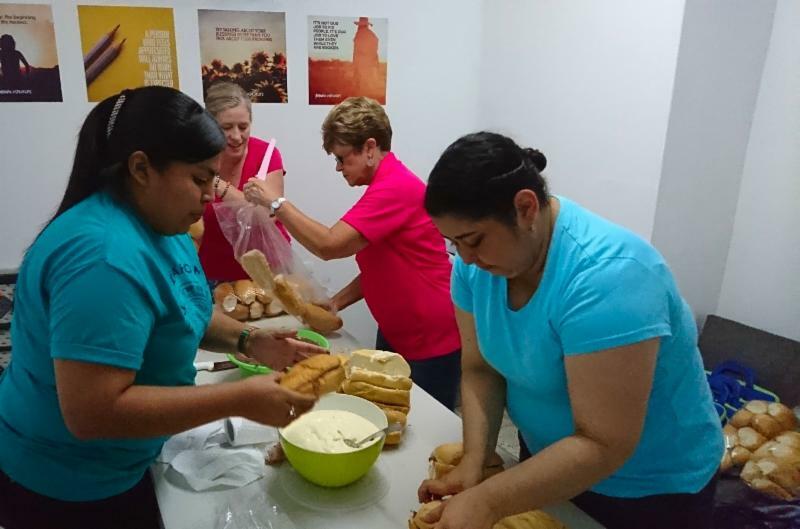 What the Transition Honduras program is doing is ground breaking. We are making a difference! The fail­ure rate for those leav­ing or­phan­ages with­out mar­ketable skills or tran­si­tion sup­port is stag­ger­ing. Most will re­sort to crime, pros­ti­tu­tion and gangs sim­ply to sur­vive. This isn’t an ex­ag­ger­a­tion. Hon­duras is a beau­ti­ful coun­try with beau­ti­ful peo­ple, but it has a lot of long-term prob­lems ag­gra­vat­ed by a poor so­cial ser­vices sys­tem and pover­ty. Hon­duras is the sec­ond poor­est coun­try in Cen­tral Amer­i­ca with one of the high­est mur­der rates in the world. It is a dif­fi­cult place to live safe­ly if you don’t have a sup­port sys­tem in place. While I was there, we had the chance to join a min­istry that gives food to the home­less in­clud­ing those liv­ing in the shan­ty­towns along the riv­er. We made 180 sand­wich­es of re­fried beans and mon­taquila (se­ri­ous­ly, yum!) and set out in the rain and in the dark to give peo­ple a lit­tle com­fort. Tegu­ci­gal­pa is a dif­fi­cult city to nav­i­gate safe­ly dur­ing the day, and here we were en­ter­ing some of the grit­ti­est neigh­bor­hoods at night. I have to ad­mit that this made me more than a lit­tle anx­ious. Our ve­hi­cles pulled up and with a friend­ly beep-beep of the horn, our team leader (who is also a mem­ber of the Tran­si­tion Hon­duras board of di­rec­tors) shout­ed out, “Co­mi­da, Co­mi­da!” At first no one came out and then lit­tle by lit­tle a group of at least eighty seeped into the street from the lean-tos of cor­ru­gat­ed met­al and sal­vaged ma­te­ri­als —from ba­bies to the el­der­ly from lit­tle boys play­ing in the rain to young teen girls vis­i­bly preg­nant. The young men sport­ing new cloth­ing and back­packs pro­vid­ed ev­i­dence that their em­ploy­ment by lo­cal gangs came with ad­van­tages. Stop by stop we pro­vid­ed the com­fort that we could for one rainy evening in a city that has lit­tle com­fort to of­fer. Without the transition program this is where Youth can end up! What we’re doing matters! The tran­si­tion pro­gram pro­vides up to a four-year sup­port sys­tem as young adults make their way through school­ing and job train­ing and to even­tu­al in­de­pen­dence. The pro­gram takes on two class­es per year of ap­prox­i­mate­ly 12 young adults each time. Right now, we have en­rolled three class­es. I had the chance to vis­it the apart­ment of one of the young women (above) who was part of our first class. She is now in her sec­ond year in the pro­gram and study­ing at the uni­ver­si­ty, do­ing well with her job, and is now able to help her sis­ter with ed­u­ca­tion ex­pens­es. As a sec­ond-year stu­dent, she has moved on from the hous­ing pro­vid­ed by the pro­gram and found a nice apart­ment on her own—which she shares with oth­ers. She’s do­ing well and we’re so proud of her suc­cess­es. She’s not the only one, those in our 2 nd and 3 rd class­es are also do­ing well. There have been chal­lenges, as there al­ways will be, but they are work­ing hard to­ward their goals, hav­ing suc­cess, and gain­ing con­fi­dence along the way. In Au­gust, the pro­gram will ac­cept 12 new young adults and, in Jan­u­ary we’ll wel­come 15 for a to­tal of 27 more youth. At that point, there will be 50 stu­dents en­rolled in the pro­gram. The pro­gram will con­tin­ue to en­roll youth un­til we hit the pro­gram ca­pac­i­ty of 86 in De­cem­ber of 2020. From then on, we’ll add stu­dents each year as an ap­prox­i­mate­ly equal num­ber exit af­ter com­plet­ing their four years with us. The most re­cent ap­pli­ca­tion process be­gan with 48 hop­ing to gain one of the next 27 spots. 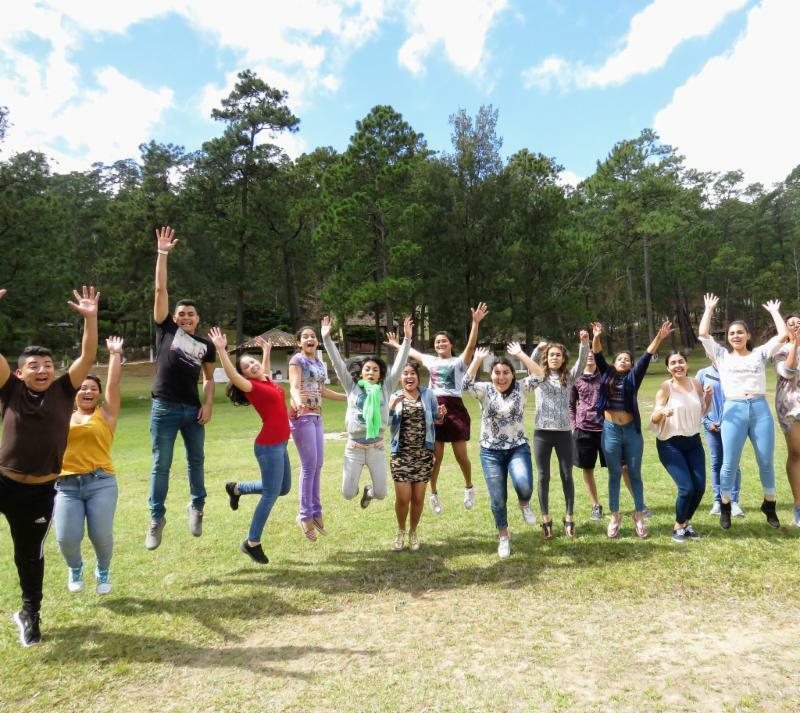 32 ap­pli­cants made it through the screening/interview process, and those stu­dents were giv­en the chance to at­tend a week­end re­treat where team-build­ing and lead­er­ship skills were as­sessed. I was blessed to be able to spend part of the day with these amaz­ing kids! They in­tro­duced them­selves to us and told us of their hopes and dreams for the fu­ture. This is where I start to cry. They are all amaz­ing and wor­thy of help, but there are only 27 spots. It’s the grim re­al­i­ty of fund­ing. I want­ed to say yes to them all … to the young men and women who dream of be­com­ing lawyers, teach­ers, com­put­er pro­gram­mers, bar­bers, bak­ers, restau­rant own­ers, elec­tri­cians, car­pen­ters, en­gi­neers. Many of them said how much they want to help their sib­lings once they can earn a good wage. This is what Tran­si­tion Hon­duras is all about. It re­mind­ed me that not only are we mak­ing a dif­fer­ence for that stu­dent, we’re mak­ing a dif­fer­ence in the world in which they live—when we help good peo­ple to suc­ceed, they go on to help others—changing their neigh­bor­hoods, city, and coun­try. While our dream is to ex­pand the tran­si­tion pro­gram to more cities in Hon­duras and into oth­er Cen­tral Amer­i­can coun­tries, the staff is do­ing their best to ad­dress the re­al­i­ty that we sim­ply do not have space for every wor­thy ap­pli­cant. With that in mind, they have been hard at work on a cur­ricu­lum for tran­si­tion course­work that can be shared with or­phan­ages around Hon­duras and be­yond. 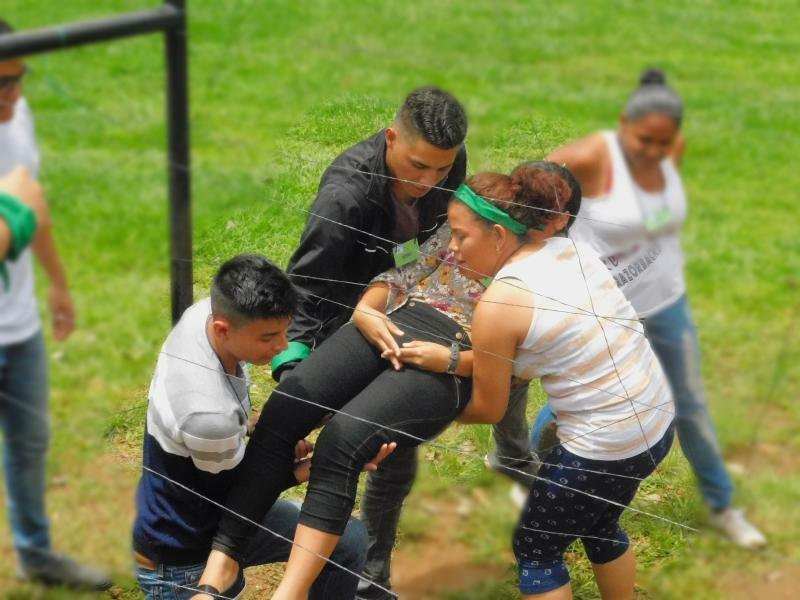 They will pro­vide train­ing and ma­te­ri­als to or­phan­age staff aimed at prepar­ing youth age 12 and up for adult life be­yond the or­phan­age. This out­reach makes it pos­si­ble to pre­pare even more chil­dren for suc­cess­ful adult lives. But none of this is possible without your help! Did you know that the full cost for one young adult in our pro­gram each year is only $3000? And that in­cludes the cost of go­ing to school at the state uni­ver­si­ty or tech­ni­cal school. (Con­sid­er­ing the tu­ition checks many of us are used to writ­ing here in the States that is shock­ing­ly rea­son­able.) This breaks down to $250 per month. Any sup­port you’re able to give al­lows us to con­tin­ue this im­por­tant mis­sion. And, if you’re in­ter­est­ed in spon­sor­ing a spe­cif­ic stu­dent, I will make sure you re­ceive per­son­al up­dates along with a newslet­ter about the pro­gram on a quar­ter­ly ba­sis. It is be­yond ful­fill­ing to know that you played a part in mak­ing the fu­ture brighter for these amaz­ing kids! We found­ed The World Or­phan Fund in 2011 with the premise we would be an all-vol­un­teer or­ga­ni­za­tion, with no over­head, staff or ad­min­is­tra­tive ex­pens­es. 100% of do­na­tions go di­rect­ly to fund projects we are in­volved with. Board mem­bers cov­er their own trav­el and ad­min­is­tra­tive costs while spon­sors agree to cov­er the cost of our events. We have vis­it­ed 13 coun­tries and 68 homes and with both God’s grace and amaz­ing donors in the U.S., we’ve been able to fund more than 50 projects. Our donors have helped launch vo­ca­tion­al train­ing and tran­si­tion pro­grams, pro­vid­ed hous­ing and ther­a­py to spe­cial needs chil­dren, re­moved ar­senic from wa­ter and solved many oth­er chal­lenges. We fo­cus on emer­gency and trans­for­ma­tion­al fund­ing, with a strong fo­cus on sus­tain­abil­i­ty and mea­sur­able re­sults. We per­son­al­ly vis­it every sin­gle home we help.